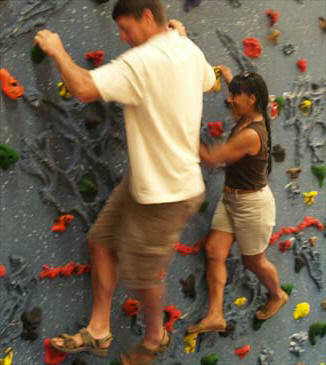 Second grade teacher Ben Mauntler and third grade teacher Sally Catanese test their climbing skills on the traverse wall. 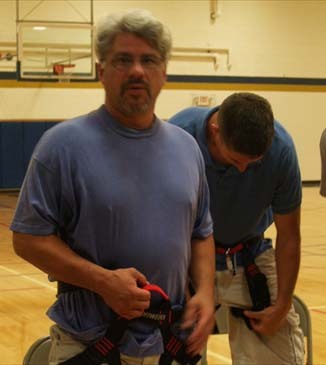 Special education teacher Nathan Bradford gets ready to tackle the high portion of the climbing wall. The many safety features provided include ropes, harnesses, helmets, and landing mats, as well as mats that fold and lock against the wall when it is not in use to prevent accidents. Although the students� first day of school is not until Tuesday, the teachers at Onekama Consolidated Schools have already begun to scale the walls. 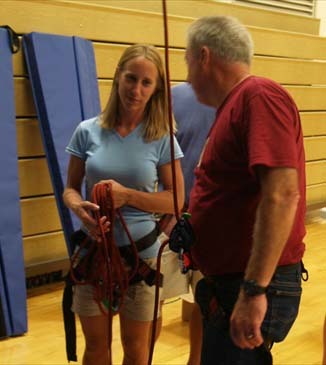 This week, in preparation for the students� arrival, Onekama teachers received safety training and instruction on the school�s new climbing wall. 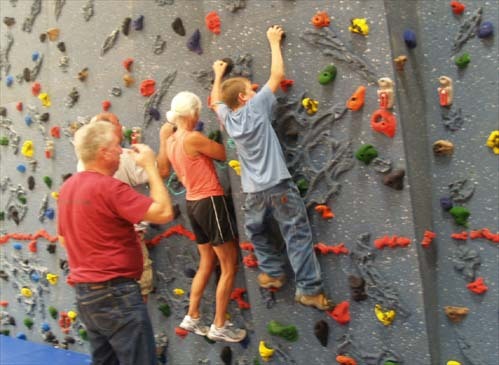 The climbing wall, which was installed in one of the school�s gymnasiums over the summer, was paid for primarily through grant money. 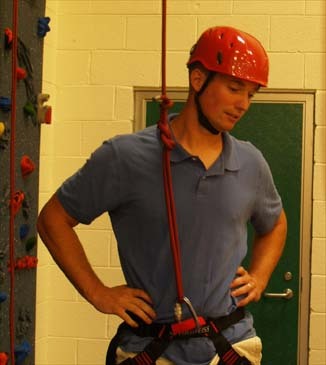 The wall includes two sections: a low traverse wall, which students can climb without a harness; and a top-rope climbing tower, which requires the use of safety harnesses. 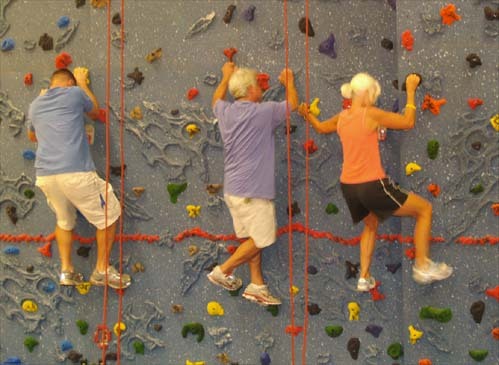 More than just an addition to the physical education program, Onekama teachers are excited about the potential benefits the climbing wall will provide all students. 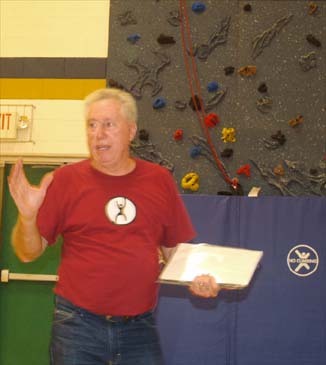 The school purchased a Climbing Wall Curriculum Guide, which is full of ideas on how to utilize the wall in all subject areas. 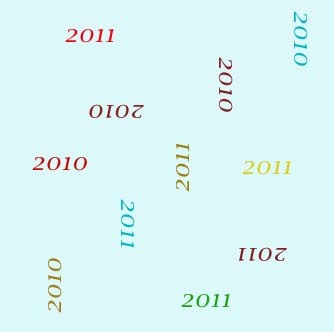 The specially-designed magnetic surface of the �magna-relief� wall will allow teachers to use magnetic words, numbers, and letters to direct students through the course. 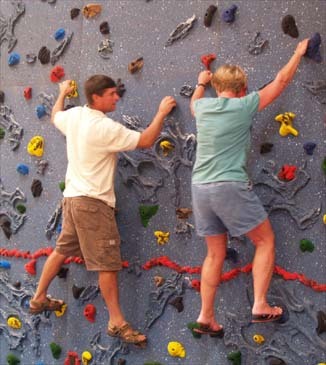 Additionally, research has proven the many benefits a climbing wall can provide, including: fostering teambuilding skills, promoting trust among peers, heightening self-esteem, increasing muscular strength and endurance, encouraging positive risk-taking and creative problem solving, and allowing students to establish and achieve long and short term goals. 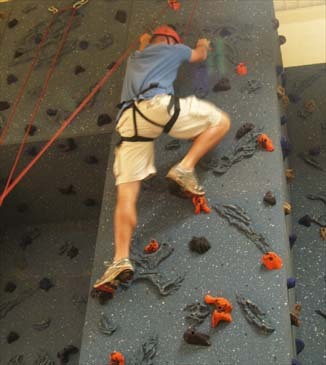 And, of course, the climbing wall is fun and exciting. Just ask the teachers at Onekama School. Onekama teachers Nathan Bradford, Thomas Bromley, along with a guest, make their way across the wall. 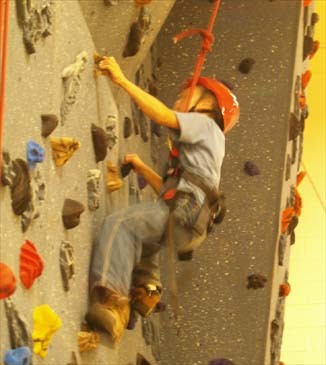 One Onekama student gets a head start climbing the wall. Amy Brown, Director of the Leaps & Bounds Early Childhood Education Program, receives instruction on the safety features of the wall. Leaps & Bounds is located in the Onekama School building and provides childcare, preschool classes, and afterschool programming. 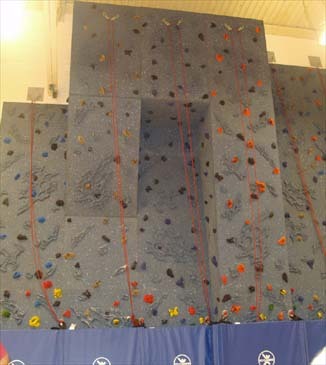 The Onekama Consolidated School climbing wall allows student climbers to scale to the top of the gymnasium wall. 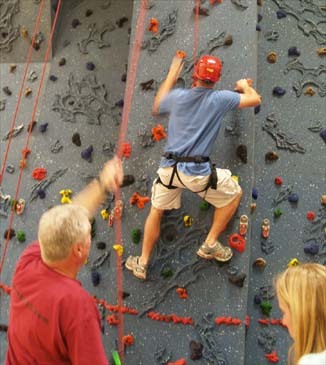 Multiple climbers can ascend the wall simultaneously. Article and captions by Megan McCarthy, photos by Bonnie Brown and pages by Barb.